Just wanted to send a thank you, as I am officially hired on with Hallmark as a P/T Retail Merchandiser in Denver, CO. I wouldn’t had been able to do this without you all! Rat Race Rebellion is the best!! – Monique F.
I don’t use FACEBOOK, but I wanted to let you guys know that I just got hired at Hilton as a Guest Engagement Specialist. Thank you for helping me find a FT WAH job! – Patricia R.
Just wanted to say thank you. I got hired with Brittain Resorts and Hotels. I start January. Thank you for the information that you guys send out every day to us — greatly appreciated. – Sunshine S.
Thank you! I got hired with Williams-Sonoma starting next week December 3. – Tonya L.
I just accepted a position with Capital One as a Senior Fraud Intake Representative! Thanks for always providing excellent work at home job leads! I was so surprised to see a Richmond, VA based position and jumped on the opportunity. – Keyara F.
I just got hired by Lionbridge. Just wanted to thank ya’ll for all you do. – Vizzion T.
I just want to say thank you for your wonderful emails and taking the time to check out the overwhelming amount of information that’s out there for work-at-home’rs. After an unorthodox application process, I got hired at Lifebushido thanks to your lead. – Katie C.
I just wanted to let you know I got the work from home job with Hyatt. All thanks to your emails! Thank you so much! – Kyndall D.
I got hired by Alorica 2 years ago through rat race rebellion!!! Then I just got hired at Liveops through Rebellion because Alorica has been cuttings hours. So now I have 2 jobs through Rat Race Rebellion & I also do Dada ABC 4 hours per week at your suggestion!!! So 3 jobs from rat race rebellion! – Lisa B.
I got hired at Brittain. Thanks to RatRaceRebellion or I would never have found them!!! Thank you so much! – Amy C.
I wanted to thank you guys once again. I was hired for Appen and also a payroll support position with Liveops. My husband got the chat position for Kelly as well. So we officially both work from home with no commute. We really appreciate you guys and will always refer people to your site. – Ashley J.
I have continued looking for work just in case and today… I was ALSO hired through Sykes to do Customer Service for TurboTax! Thank you so much for your continued help with REAL legit work from home jobs! – Tamara S.
Thank you for all you do. Today I accepted a job offer with Hilton starting in January. – Cassandra S.
I emailed you a couple of weeks ago, to report that I have a new job with Amazon and I’m testing with Lionbridge. All thanks to y’all! Well, I just want to say, “Thanks again!” I’m enjoying my new job and the flexibility. I’ve been subscribed to your newsletter for years and I tell so many people about you. You’re changing lives with the information you provide. I appreciate you and have a blessed day! – Cherie H.
I was hired with Shipt as of November 6th. I shop my first order today! Thanks RRR! – Angel W.
Thank you guys so much! I am now a independent contractor with NexRep. I recommend you to everyone. You guys rock! – Kimyarda J.
I got Hired at Sykes. Thanks! – Victoria R.
Hi. I got hired at NexRep today, thanks so much for posting these jobs. – Ebony B. Just hired at Williams-Sonoma!! I beat the rat race….thank you Rat Race Rebellion!! – Erica E.
I’ve received a job offer yesterday at CONCENTRIX as an Advisor I – Customer Care Service Rep; I will start training/working on January 8th! This worked out PERFECTLY, since my last day of work and beginning of retirement starts on January 7th! This means I’ll transition right on into another job without missing a beat! Thanks to you all for your honesty and sincere genuiness to help other folks find honest work-at-home jobs! – Beverly M.
I am happy to announce in just got hired with Rev for a captioning position. Looking forward to getting started and I thank you for posting this opportunity! – Latasha N.
Just wanted to let you know I got hired! 😊 I can’t remember how far back I saw the post for TTEC Data Entry, but immediately jumped on it as those go SUPER fast! I just started training on 11/26/18. Thank you so much for this site! Have a great day! – Mia U.
I got the job with Aspire Lifestyles! – Shalunda D.
I absolutely love your site. I have sent so many people to your site b/c they have mentioned that they want a legitimate wfh job. I recently got hired with NexRep and I start on Dec 19th. Thanks Guys!! – Ashley N.
I’ve been hired. My official start date for Contemporary Virtual Assistance is December 28th. I’m so thankful for this opportunity. Thanks Rat Race Rebellion. – Betty P.
I just wanted to share that I got my very first transcription job with Rev!!! I’m super excited for this opportunity and never would have found it without RRR! – Amanda T.
I just wanted to write and tell you how much I appreciate your newsletter. Words can’t even express how grateful I am for the jobs you post. I’m a little late in writing this, but, I was hired by Amazon in October, all because I heard of the opportunity thru your site. My daughter, Zoe, also got hired last week with Rev because she saw the listing on your site. I’m a heart patient. I have neuropathy and fibromyalgia and trying to go to a regular 9-5 was horrible. I was previously a 911 Dispatcher but having to sit still for 12 hours straight was very hard on my body. Being able to work from home is such a blessing because I can still make an income and I just don’t know how people survive on what disability pays. Thank you so much for everything! – Lisa H.
I got a job with Lionbridge and MaritzCX. Thank You! – Kelly W.
Thank you so much for the daily emails I got hired at Liveops! – Whitney S.
I landed a position with NexRep as a chat agent. So far so good!!! – Crystal D.
I was hired with Williams-Sonoma. Thank you RRR!! – Charisma M.
I just wanted to thank RRR and let them know that I got hired with TTEC. I start training tomorrow. I have been out of work since June 2018 and decided that I would like to transition to a work from home career so that I could be here for my 11 year old son who just started the 6th grade. I have applied for several work from home positions with no luck and then this opportunity was presented to me. I have been so excited because “it gets my foot in the door”. I knew that if I kept applying I would eventually be blessed with a job. My husband and son are so excited for me and keeps telling me how proud they are for me. I am truly excited to finally be employed and I a blessed that I can now help my husband with bills in the house. So I just want to say thank you again to RRR for presenting so many opportunities for a person to choose from. – Treva F.
Thanks, guys. I have recommended you to others. I was hired by Rev.com. – Mike V.
My name is Joy and I’m from Texas. I just got hired by Hilton!!! Woo hoo! Thank you RRR for all of your dedication to helping people find their dream job!! I am a single mother and have been stressing so much about finding work! This is the best Christmas gift EVER!! – Joy B. Thank you Rat Race Rebellion I got hired at Hilton today and I’m so thrilled!!! – Monique G-F. Hired by Appen Global, I found on your Website, a few months ago, doing projects that pay well. Thank you for the listing. – Andrea A.
I got hired at Working Solutions!!! Thanks RRR – Heather L.
Thank you so much! Because of your daily e-mails, I now have a job with Appen and will be starting in the next couple days. You guys are GREAT! – Rose K-W. I just got hired with Alorica start on January 2nd.. Thanks for everything!! – Latoya B-H.
Lionbridge just hired me as a part-time remote Multimedia Assessment Judge. Work starts this week. Thanks for the lead, Rat Race Rebellion! – Mary Jo O. My mother and I got hired by WeGoLook and OnSource a couple of months ago and we love working for both of them!! We have had very few issues – we get paid on time and get feedback about our performance…definitely recommend either or both of these companies. – Kirstie C.
I was just hired by Lionbridge as a work from home reviewer, wanted to thank you guys for the awesome leads you provide. Thank You. – Samira S.
Start with Jackson Hewitt next week, Nexrep the week after and a very part time position with Lionbridge the week after also. Thanks!!!!! – Renée J-P. I got hired at Concentrix WAH! I start in January and can’t wait! – Lisa S.
I got hired at William-Sonoma 12/3 Thank you Rat Race Rebellion you are a life saver! – Aliyah S.
I got hired on as a Rater with Lionbridge!!! I start the 13th!!! Thank you so much, RRR!!! – April C.
I got hired with Sykes!!!!! Thank you for the job leads. – Shalonda W.
I got hired by both Amazon Flex and Rev Captioning! – Kim K.
I got hired at Working Solutions for their StubHub program! Thanks Rat Race Rebellion! – Angela T.
I was hired as an Expert at Just Answers! – Jill F.
RRR has been a HUGE help with helping me kick off my Work From Home Career. I’m happy to say that I am about to start my 2nd and final week of training as a CS agent with NexRep! 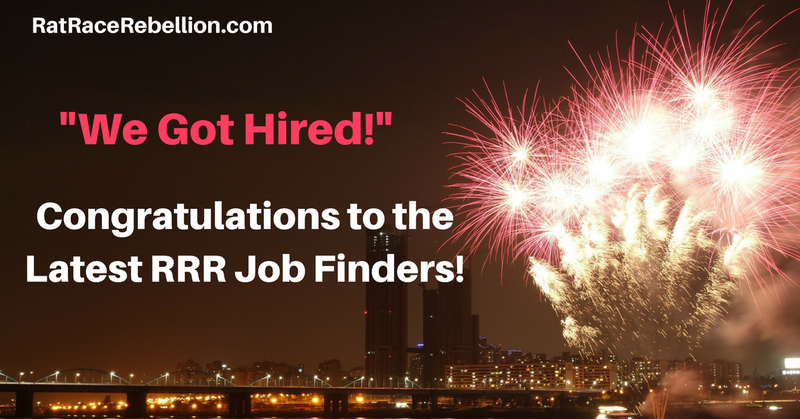 BIG THANKS to the folks behind RRR for supplying remote job seekers with all of the helpful information that is on the website! – Kristin M.
I was hired by Rev (captioning) and Liveops! So happy! Thank you RRR. – Nancy Lee J. Hey! I got hired by Lionbridge and Rev! I look forward to my email everyday. Thanks so much. – Driver C.
I start with Alorica on January 2nd! Thanks for the lead! – Christi L.
I GOT HIRED for my first ever work from home job through Rat Race Rebellion. I actually used to work for the company I was hired for back when they were called NCO and I worked for them for a short time in June 2018 until I was hired at another job. Today I received my offer letter for Alorica work from home job! – Jasmine H.
Thank you Rat Race Rebellion. I got work with TTEC working from home. You guys are the best! – Rosemary W.
I got hired as a Google Search Reviewer at Lionbridge!! Thanks so much for all your help!!! – Jasmine L.
I’m so excited to say thank you to Rat Race Rebellion. I looked over the website and the FB page for months and applied at many jobs. But I now have landed a transcribing job with Gotranscript.com and another job with Rev.com as a captioner. Thank you so much. I ain’t gonna get rich but it will help out each and every month. – Amanda B. Thanks!! I just got offer not one job but 2 one working with Working Solutions! And the other one is rater hub😁😁😁😁I’m so excited!! – Crystel B. Thank you RRR. Because of you I got hired on at Lionbridge! – Crystal T-M.
Got hired at Lionbridge thanks to RRR! You guys are the best! – Judy H-D. I got hired! Just got my onboarding email from Babbletype! I am a transcriptionist. Thank you Rat Race! – Chelsea W.
Hired at Williams-Sonoma!!! Thanks RRR!! – Erica E.
Got hired at NexRep yesterday thanks to your site! You guys are the best! – Allegra B.
I got hired with Williams-Sonoma. Thank you RRR for all your hard work! – Danelle P.
I just got my acceptance letter from Rev.com, I honestly thought that this was just another unfulfilled promise of making money in my spare time from my home. But to my delight it is not! Now I can make that little bit of extra cash without sacrificing any more time away from my family. Thank you so much RRR – I am now a life long true believer and promoted – I can’t thank you guys enough for this opportunity!!! – Kristy S.
I wanted to write to you about my Success Story, I recently got hired on at KellyConnect and start training on November 19th, please post this on your website! Thank you for helping me find this job! – James K.
Thank you RRR I just took my first class tonight for Liveops as an independent contractor for Victoria’s Secret. I am so excited and grateful for this opportunity. Thank you for making sure we are safe by only putting up legitimate companies and for making it so easy to locate and apply for places that fit our needs and interests. – Bridget O.G. I got a contract with Working Solutions, after applying to a post. Thanks RRR! You rock!! – Swift W.R.
Hi guys! I just wanted to say thank you for all the hard work you both do notifying us of legitimate WFH jobs! It has saved me countless hours of searching myself. With that being said, I wanted to let you know I GOT HIRED! I start with Williams-Sonoma on Monday!! Thank you soooo much!! – Dominique N.V.C. Just accepted a position with Working Solutions for Turbo Tax. I work full time now and this lets me work part time in the evenings for some extra income. Thanks Rat Race! – Lisa M.
Hey Mike & Chris… wanted to thank you for your postings and website updates because I’ve just been hired by Hilton as a Guest Engagement Specialist from home… been posting resume after resume and finally… Hilton to the RESCUE!!!!! Again thanks sooooooooooo much guys. – Paul H.
supposed to be out on 12/21). There are numerous quizzes and 2 tests. You get 2 chances on each to make a certain score and if you don’t you are terminated. You’re charting/documenting is evaluated in real time on 2 different occasions and if you don’t pass you’re terminated. On a positive note, this week I was offered full time which includes benefits. Sorry for the lengthy email but thought I would let you know about the orientation process should you want to pass any of the information along to others. This week I was offered full time which includes benefits. – Brandy A. This entry was posted in Success Stories - "I Got Hired! ", Work at Home Jobs and tagged HIRED. Bookmark the permalink.